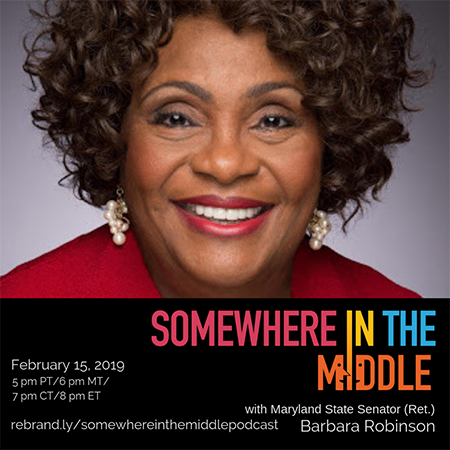 Senator Barbara Robinson served the people of Baltimore, MD. She considers herself a woman of achievement and integrity who believes in people and progress, not politics and power. As a member of the Maryland General Assembly, she refused to be influenced by shady deal-making and unethical government proceedings and has kept her promise. She has been recognized professionally with many awards including the "African American Women in Business Visionary Award", "Woman of the Year" by Zonta International Inc, induction into the Maryland Women’s Hall of Fame, and was even Honored at the White House by Bill Clinton. Prior to serving in the state Senate, Robinson served in the Maryland House of Delegates, representing District 40 from 2007 to 2016. Robinson has earned three degrees including a B.S in Business Administration, an M. Ed in Criminal Justice Administration, and a C.A.S.E in Education, along with nineteen certificates of completion in areas like data processing, counseling, conflict resolution, and advanced negotiations training. Her extensive career accomplishments range from teaching inmates in prison to founding a multimillion-dollar healthcare enterprise to developing the nation’s first court clerks’ program for the District Court, the Supreme Bench, and the Department of Corrections. You can reach out Sen. Barabara Robinson through her website http://www.senatorbarbararobinson.com. Connect with Michele Barard, host of Somewhere in the Middle, at https://www.urbanbookeditor.com or https://www.michelebarard.com.